What a clear and beautiful explanation coming directly from your heart. Thank you, Jean. I do desire to worship God as he deserves. I know you do, too! Your prayer was wonderful. I have made it mine, also. Thank you, Nikki. It warms my heart to know we’re praying the same thing! Beautiful post, Nancy! Thanks so much. Thank you, Diana, for stopping by. I know your time is limited! Nancy, I found this to be very insightful. Thank you. I will look at contemporary services in a different light. Love to you and Steve. Please stay warm and safe. Thank you, Ruth. 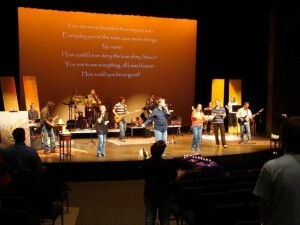 It’s a shame that “worship wars” have plagued our churches the last twenty-five years or so. There is value in both contemporary and traditional worship. I, for one, love both! P.S. So far Steve and I have been able to stay warm AND safe, in spite of this crazy-cold weather! Love to you, too, Ruth. I’ve long struggled with worship, being unsure of what that really means. You’ve given me much to ponder here with your wise words. Thank you! The idea of a river of praise, thanksgiving, and worship came from Selwyn Hughes, a Welsh pastor of the last century. I love his writings! (The contrast to a braid came from MY head–inspired by the Spirit, I trust.) May God continue to bless your desire to understand worship more fully, Rebeca. However, I don’t think God designed worship to be a complicated mystery. Just expressing our heartfelt joy in God, his presence, his attributes, and his blessings, is worship which he will surely appreciate! Nancy, songs of praise was just done in FUMC of Hudson yesterday. We had the Festival of Choirs. The church was packed, everyone enjoying the music of the Lord. Those choir festivals are truly Spirit-infused worship celebrations, aren’t they? So glad the 2015 event was so inspiring! I am so ‘rooted’ in the traditional ‘worship’ hymns of my youth that I have never given the contemporary praise songs a chance. I am going to have to rethink my stance. It’s just that hymns (many of which are, indeed, praise hymns, like “Rolled Away”) have a calming effect upon me which I truly need in the frenetic world.